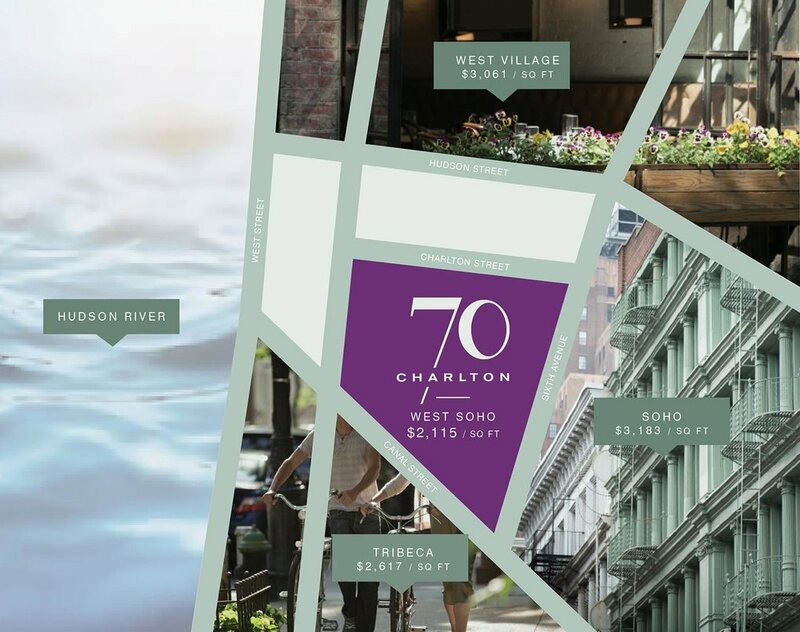 70 Charlton offers attainable luxury living in the emerging West SoHo neighborhood, situated in the heart of the vibrant and newly rezoned Hudson Square. Located north of Tribeca and south of the West Village, this neighborhood is an emerging centerpiece of refined downtown living. Be one of the first to take advantage of this unique opportunity to live in the center of it all. The blocks surrounding 70 Charlton are in the midst of transformation. Rezoning is introducing new luxury apartment residences, green spaces, an elementary school and other community amenities to this formerly industrial micro-neighborhood. Existing loft spaces have already attracted leading architecture, design, tech and media companies, drawing new restaurants, cafes and shopping to the area as well. 70 Charlton is leading the residential trend as the first new residential development to come to market since the rezoning. Learn more about what's ahead from the Hudson Square BID, and follow our NEWS for neighborhood profiles and updates. Cross 6th Avenue and you're in downtown's prime shopping district, with luxury brands like Chanel and Louis Vuitton and hot fast fashion brands like COS and And Other Stories. The area is also noted for its open-air restaurants, cozy cafes and hot spots that are Michelin-rated, but never stuffy. Just north, The Village provides a lower horizon, punctuated by the rhythm of water towers and the choreography of the sidewalk. This is a place where the grid gets rumpled like a good bed sheet, and a luminous patina is valued over a polished sheen. TriBeCa and the reborn Financial District are minutes to the south, where the city is ever-transitioning from work to play to rest. Quiet streets and riverfront parks make it easy to roam. Whichever direction you head, there’s something to discover right outside your door.